PAL Studio Theatre, 581 Cardero St. 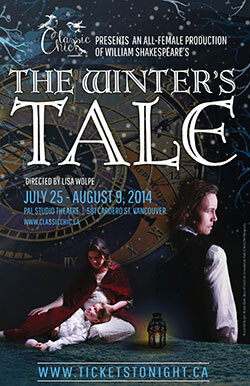 The Winter’s Tale, opening July 26 and presented by Classic Chic Productions, promises fire and ice aplenty, at the direction of master interpreter of the Bard, Lisa Wolpe. The epic and romantic fairy tale features an all-female ensemble in this debut production for Classic Chic, a newly formed Vancouver women’s theatre collective. A punch in the gut, the play delivers the tales of the suffering and rebirth of its women, but ultimately this is a sacred story of a triumphant emergence from darkness into light. Bursting with music, dancing, swordplay, and circus skills, The Winter’s Tale spins an eloquent text ranging in scope from powerful tragedy to vaudevillian light comedy. The nucleus behind Classic Chic Productions: Christina Wells Campbell, artistic director; Corina Akeson, production manager; Joanna Redfern, communications; and Michelle Martin, fundraising, all accomplished in theatre, are dedicated to performing the classics. Wolpe has played more of the Bard’s male roles than any woman in history, always to superlative reviews. She recently received the Lee Melville Award for Outstanding Contribution to the LA Theater Community and was awarded the Key to Harlem and a Congressional Certificate of Merit for her work with the Harlem Shakespeare Festival in 2013. While in Vancouver, she will perform her one–woman show, Shakespeare and the Alchemy of Gender, at the Orpheum Annex on July 16, presented by Railtown Cultural Eclective, and also offer an acting workshop TBC.